‘With a renewed interest in holistic treatment for schizophrenia, psychotherapy re-emerges as an important modality and Lotterman's classic book shows us how to do it! Lotterman's expertise is gritty and real with numerous case examples to make his approach clear.’ - Eric R. Marcus, MD, Director of Columbia University Center for Psychoanalytic Training and Research and Professor of Clinical Psychiatry at Columbia University College of Physicians and Surgeons, USA. ‘This is a terrific book, full of astute theoretical formulations, recommendations for clinical technique, and case examples, written by a skillful clinician and clear thinker with a true heart for this essential form of treatment. 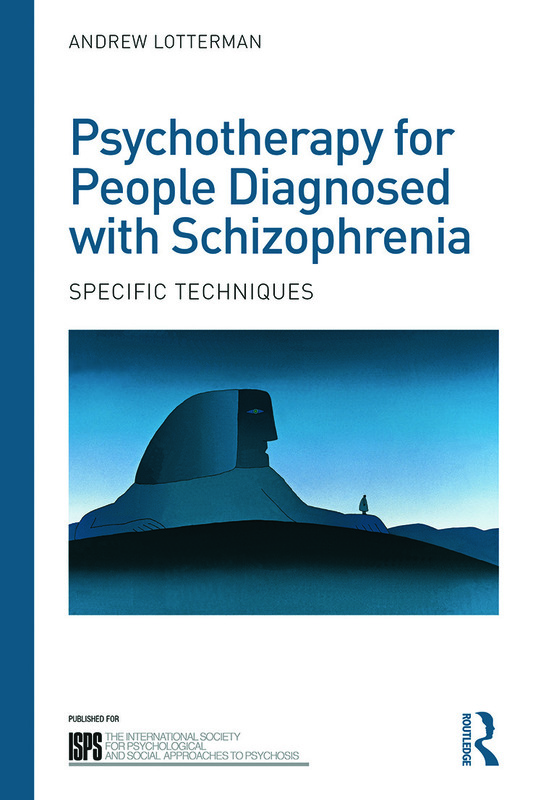 It is a must for any clinician caring for psychotic patients who maintains a serious psychotherapeutic ambition in his or her work.’ - Michael Garrett MD, Vice Chairman and Director of Clinical Services, Department of Psychiatry, SUNY Downstate Medical Center, Brooklyn; Faculty, Institute for Psychoanalytic Education at NYU Medical Center, New York, USA. ‘Andrew Lotterman's work puts excellent tools and maps in the hands of the practicing clinician with which to navigate the complexities of the psychoanalytic work with persons experiencing psychotic states. I highly recommend this worthwhile book for anyone interested in psychodynamic and psychotherapeutic approaches to psychosis.’ – Brian Koehler PhD, President, The International Society for Psychological and Social Approaches to Psychosis, United States Chapter. Acknowledgements. Foreword. Preface. Introduction: The Roles of Biology and Psychology in People Diagnosed with Schizophrenia. 2. Diagnosis. 3 Structuring the Treatment. 4. The Psychological Therapy of Patients Diagnosed with Schizophrenia. 5. Techniques in Specific Clinical Situations. 6. Mental Processes in People Diagnosed with Schizophrenia. 7. Outcome. 8. Paranoia: Clinical Presentation and Psychodynamics. 9. Two Clinical Syndromes: The Shattered Self and the Wish to be the Messiah. 10. Comparison with Other Techniques. Appendix. Andrew Lotterman, M.D., is a training and supervising psychoanalyst and associate clinical professor of psychiatry at Columbia University, USA. He has published widely on psychotherapy for psychosis. ISPS (The International Society for Psychological and Social Approaches to Psychosis) has a history stretching back more than five decades, during which it has witnessed the relentless pursuit of biological explanations for psychosis. This tide has been turning in recent years and there is growing international interest in a range of psychological, social and cultural factors that have considerable explanatory traction and distinct therapeutic possibilities. Governments, professional groups, people with personal experience of psychosis and family members are increasingly exploring interventions that involve more talking and listening. Many now regard practitioners skilled in psychological therapies as an essential component of the care of people with psychosis. A global society active in at least twenty countries, ISPS is composed of a diverse range of individuals, networks and institutional members. Key to its ethos is that individuals with personal experience of psychosis, and their families and friends, are fully involved alongside practitioners and researchers, and that all benefit from this collaboration. ISPS’s core aim is to promote psychological and social approaches to understanding and treating psychosis. Recognising the humanitarian and therapeutic potential of these perspectives, ISPS embraces a wide spectrum of therapeutic approaches from psychodynamic, systemic, cognitive, and arts therapies, to need-adapted and dialogical approaches, family and group therapies and residential therapeutic communities. A further ambition is to draw together diverse viewpoints on psychosis and to foster discussion and debate across the biomedical and social sciences, including establishing meaningful dialogue with practitioners and researchers who are more familiar with biological-based approaches. Such discussion is now increasingly supported by empirical evidence of the interaction of genes and biology with the emotional and social environment especially in the fields of trauma, attachment, social relationships and therapy. Ways in which ISPS pursues its aims include international and national conferences, real and virtual networks, and publication of the journal Psychosis. The book series is intended to complement these activities by providing a resource for those wanting to consider aspects of psychosis in detail. It now also includes a monograph strand primarily targeted at academics. Central to both strands is the combination of rigorous, in-depth intellectual content and accessibility to a wide range of readers. We aim for the series to be a resource for mental health professionals of all disciplines, for those developing and implementing policy, for academics in the social and clinical sciences, and for people whose interest in psychosis stems from personal or family experience. We hope that the book series will help challenge excessively biological ways of conceptualising and treating psychosis through the dissemination of existing knowledge and ideas and by fostering new interdisciplinary dialogues and perspectives. For more information about ISPS, email isps@isps.org or visit our website, www.isps.org. For more information about the journal Psychosis visit www.isps.org/index.php/publications/journal.